Bust 42-46", Waist 34-39", Hips 44-48"
1998, 90s Evening, Retro Beginners Clothing Patterns - MISSES' CAPE, JACKET & COVER-UP. 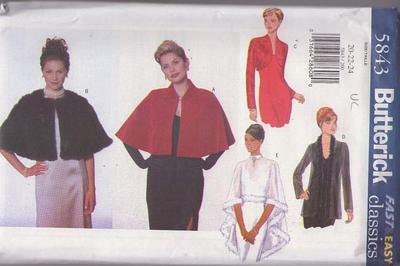 Loose-fitting, lined, above waist cape. A: collar, but ton/loop. B: hook and eye. No Provision for Above-Waist Adjustment. Fitted, lined above waist jacket has raised neckline. Loose-fitting, unlined, below hip jacket. C,D: long sleeves. Oversized cover-up has collar, back button/loop closure. D,E: purchased trim.